The other woman, Rachel Mitchell, shouldn’t have been there either—asking questions at the behest of a panel of male Republican senators, too afraid of how it would look to question Ford themselves. So, they sent a woman to do their job. And there they were, two women who shouldn’t have been there, squaring off on televisions across the country. This wasn’t the first time our national political process has ground up the bodies of women and spit them out under the guise of “the process.” Anita Hill, Paula Jones, Monica Lewinsky, and before that others—plenty of women whose names have been forgotten, women used for political purposes and then cast aside. Even if they are willing—like Sarah Huckabee Sanders or Kellyanne Conway, or every impassive political wife who sits perfectly coiffed next to her cheating senator husband as he does his half-hearted mea culpa tour—they are the human shields for our supposedly just political process; the bodies we use to achieve political ends and justify the means of our causes. We tear apart their appearance, their credibility, their clothes, their hair, their glasses, the way they sigh. We cannibalize their tears, which we chalk up as weakness. If they show no emotion and they are too cold. And they can be impeccable, like Ford. They can clearly and calmly advocate for themselves, with an expert-level of knowledge about trauma and the brain, but it doesn’t matter. They could be perfect—that impossible mix of pretty, but not too pretty, smart but not too smart, credible with eyewitness testimony, but not so much that it seems like they are staged, and it wouldn’t matter. It’s not that they aren’t believed, it’s that their words don’t matter. Their bodies don’t matter; neither does the pain inflicted on those bodies. Pain for women in the American political process is de rigueur, while a man facing consequences is an injustice. This was made clear when Kavanaugh testified and the Republican senators immediately dispensed with Mitchell. Her services rendered, she was tossed aside, left sitting at the small desk beneath their bench, so they could yell and perform masculine justice. They apologized to Kavanaugh; they apologized for the alleged damage done to his reputation. Apologized that their colleagues dragged his name through the mud. The injustices abounded. This was clear when Kavanaugh spoke—unpolished, raw emotion, unmeasured, erratic, contradictory. But he is the credible one. We saw this in the election. The qualified woman; the unhinged man. The unhinged man won then and he will win now. And spare me the Hillary Clinton won the popular vote argument. To do so is to erase the large swaths of men and white women, who voted for this. And they voted for this precisely so a man like Kavanaugh would be put on the Supreme Court, no matter the costs—no matter how many women have to be tossed aside or villainized. Whatever moral high ground demanded of Ford—and of women, generally—is a land built of fiction. Its language is empty, peppered with words like “brave,” “bold,” and “sacrifice”; reliant on phrases like “I believe you” and “speaking her truth.” It sounds very progressive—very supportive—but the words don’t matter. Because you want none of those things; I want none of those things—none of those words, those sentiments. I want people to listen and take action. I don’t want to be valorized (who wants the heroism that comes with being a survivor of sexual assault?). I want justice. 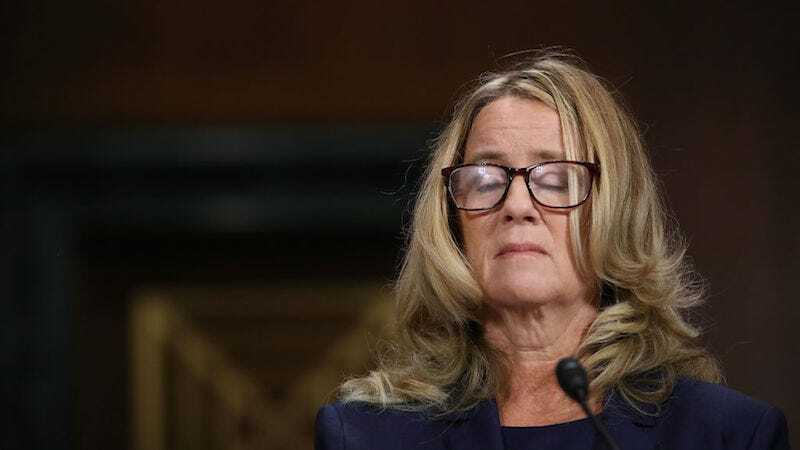 Ford referred to her testimony as her civic duty. As if she owed us her body and her pain. Misogyny insists a woman owes us something—access to her body, her soul, her tears, her labor. And this is especially true in sexual assault cases. Misogyny, after all, isn’t after all about hating women, it’s about keeping them down, trapped in a game they will never win. It’s about keeping them standing in front of a firing squad of angry men. Men who are too afraid of the “optics” of the system they’ve created; men who have hired a woman to pull the trigger. Democrats will keep Ford locked in this place too. Democrats will invoke her name, long after she wants it out of our mouths, as a rallying cry for causes. Many of these will be causes I believe in, causes I wish we could advance without sacrificing women over and over and over again. It works the other way too. Mitchell was used willingly, but still used—a body double for cowardly men. A mouthpiece for their agenda. Maybe she wanted to. Maybe she felt forced. The women of the Trump administration are there of their own volition, but that doesn’t mean they aren’t being used to shield men from the consequences of creating a government determined to punish women; determined to punish people of color. But maybe something is changing. I hope it is. Thursday’s spectacle was supposed to reassert the norm; to remind women to stay silent and return to the maintenance of men and their good reputations. But maybe that kind of public intimidation is no longer enough. Calls to the National Sexual Assault Hotline spiked by 147 percent during Ford’s testimony. In asserting her story, Ford was breaking the cycle of silence that misogyny insists upon; she, at least, refused to be silent. These stories have been told time immemorial, and they will continue to be told. We need to respond to them better than with empty platitudes. We need to respond to them with decisive action by immediately working to change the culture and policies and the system of governance that has demanded such “bravery.” It’s not enough for a woman to speak “her truth,” as the platitude goes; it’s simply the truth. Change should not demand the bodies of women. It should not demand our sacrifice or our pain. But I think it will. Lyz Lenz is the author of the forthcoming book Godland for Indiana University Press and Belabored forthcoming from Nation Books. She is a writer for the Columbia Journalism Review.